Hanging out and recovering after a run. After reviewing Columbia's Heat 360 1/2 Zip Top earlier this month, I was excited to try out Columbia's newest innovative baselayer. After all, baselayers are among the most important pieces of clothing we use during cold weather activities. At first glance, the Women's Baselayer Midweight Stripe Tights were the brightest piece of layering clothing I'd ever seen, but that's not the only thing that sets them apart. When you're active outside in the cold, it's important to manage body temperature to avoid sweating too much. Sweat makes us wet, and being wet can cause all sorts of problems in cold weather. Columbia's Midweight Stripe Tights are are made using innovative Omni Heat technology, which helps our bodies retain the heat we naturally generate. And when I'm playing outside in the cold, I can use all the help I can get. Little silver dots printed on the inside of the tights keep the right amount of warmth in while Columbia's Omni Wick technology helps wick moisture away from the skin. The dots have been printed in strategically placed locations to ensure we retain heat in the right places. There are no dots printed on the upper inner thigh, for example, to help manage perspiration. Outside of technological advances, finding a baselayer that fits perfectly is essential. There's not much worse than tights bunching up under ski pants or under a hard shell while you're halfway up an ice wall (I've experienced both). The tights fit true to size and they stay put. The waistband is snug enough to keep them in place, but doesn't cut off circulation. It also sits just below my natural waist, which is perfect. The fabric's construction allows outer layers to move easily over the tights, and when I had them on, it almost felt as though they weren't there. I wanted to see how the tights helped me regulate my body temperature, so I took them out for a run in 45ºF temperatures. They're definitely not wind-proof, but the amount of warmth my body created and sustained during the run negated the wind chill. I was too warm after 15 minutes of running, but didn't notice an unwanted perspiration sticking around. The tights allowed my skin to breathe. They stretched enough to allow freedom of movement. I was glad to find that despite normally needing pants in long lengths, the 28" inseam was a good length for me. Overall, the tights are a great addition to any layering system. I'd like to see them available in different colors; I love rocking a little bit (or a lot) of color, but options are never a bad thing. It was a challenge to find any real flaws with them! If you're still not convinced the Omni Heat technology will do the trick, just watch this. And be prepared for a lot of giggling. 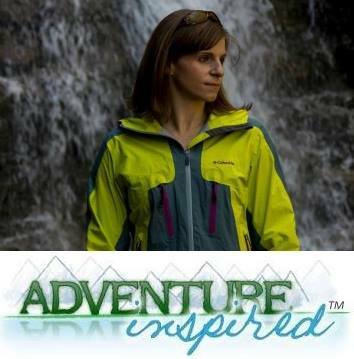 Disclosure: Columbia provided Adventure-Inspired with a complimentary Women's Baselayer Midweight Stripe Tight free of charge for this review. For more information about the Adventure-Inspired gear review policy, please click here. these are super cute! i'm a sucker for stripes. i need some new underneath clothes so maybe i'll check these out. a well-meaning relative bought me some silk longjohn pants that come up past my belly button and are really baggy in the bum...they need to be replaced. stripes are the best! I was pleasantly surprised to find the waistband sits almost exactly where I want it to. I know what you mean about the high-waisted long johns; they're definitely not comfortable. These sound like they'd be right up your alley! looks so cute, perfect stripes!